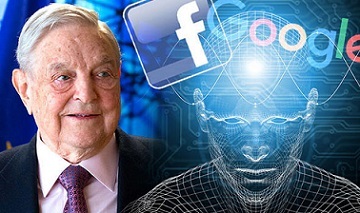 Collaborations between the powerful American Silicon Valley Overlords and Chinese overlords of population surveillance and control portend dark omens which should greatly concern us all. Here, as in China and other countries, spy cameras are sprouting up on lampposts and rooftops. Facial recognition systems can detect and record each of our individual movements. The location of our cars and cellphones are constantly being recorded. Online shopping preferences and lifestyle interests are being tabulated and distributed to product and service agencies. Our smartphone can eavesdrop on personal conversations and secretly pass along private information. Beginning in 2020, China’s “social credit system” will become mandatory. Every citizen in China, which now numbers well over 1.3 billion, will be given a score obtained from monitoring their social behavior – from spending habits, how regularly they pay their bills, to their social interactions and how well they are complying with the Chinese government’s acceptable behavior. This score will become the basis for the government to determine that individual’s trustworthiness, their eligibility for a number of services, including the kinds of jobs or mortgages they can get, and what schools their children qualify for. This actually sounds worse than an Orwellian nightmare. The Dragonfly search app was written to automatically filter websites that are blocked by China’s “Great Firewall,” which the government uses to enforce their strict censorship of news, political dissidence and even academic studies. According to the leaked documents, Dragonfly would “blacklist sensitive queries” as well. The Chinese government would also be able to access people’s search records, posing significant danger to those the government systematically targets, such as journalists, activists and political opponents. One patent application uses information about how many times you visit another user’s page, the number of people in your profile picture and the percentage of your friends of a different gender to predict whether you’re romantically involved with anyone. Another patent application characterizes your personality traits and judges your degree of extroversion, openness or emotional stability in order to select which news stories or adds to display. Yet another application would review your posts, messages, and credit card transactions and locations to predict when a major life event such as birth, death, or graduation, is likely to occur. Facebook will be able to identify the unique “signature” of faulty pixels or lens scratches appearing on images taken on your digital camera to figure out that you know someone who uploads pictures taken on your device, even if you weren’t previously connected. They will also be able to guess the “affinity” between you and a friend based upon how frequently you use the same camera. They have also applied for a patent to use your cellphone microphone to identify the electrical interference pattern created by your TV power cable to reveal which television shows you watched, and whether you muted advertisements. In addition, there are also a couple of patents applications that will track your daily and weekly routines to monitor and communicate deviations from regular activity patterns, your phone’s location in the middle of the night to establish where you live, when your phone is stationary to determine how many hours you sleep, and correlations of distance between your phone’s location and your friend’s phones to determine with whom you socialize with most often. But of course they will never really use this “exploratory” stuff. Right?